Device ID plays an instrumental role in all stages of the user journey and experience, including install attribution, in-app personalization, audience segmentation, and overall app performance. What types of Device ID exist? The device ID number will vary depending on the operating system being used. Device IDs on Android are called Google Advertising ID (GAID), which can be accessed, personalized, and reset through the Settings menu. Device IDs on iOS are known as Identity for Advertisers (IDFA). Both types of device ID are used for easy tracking of users as they progress through the app install and engagement journey. Why does Device ID matter? In the desktop era, the cookie was the staple of digital advertising and measurement. The problem is that the average “lifespan” of the cookie is no more than three weeks, creating inconsistencies when measuring long-term user journeys. One clear benefit of the device ID as compared to the cookie is its persistence, or ability to present a clear view of a user based on deterministic data across longer, if not indefinite, stretches of time. Measurement based on device IDs can only be “interrupted” with a device ID reset, which is extremely infrequent. Both the GAID and IDFA device ID numbers can be used in various mobile attribution methods, giving a detailed user profile to complement and enhance mobile advertising activity. The information obtained from device IDs can be used to analyze specific user trends, as well as to further categorize them into cohorts (groups with similar traits). Most importantly, with a device ID, you can understand not only identify your users, but how they have, and will, behave over time. Such a use of device ID is known as ID matching, one method of mobile attribution which is considered to be highly reliable and extremely accurate. Device ID matching provides the user behavior data that will then be aggregated and analyzed based on specified cohorts and usage criteria. In simpler terms, you will be able to see whether or not a user viewed or clicked on your ad, installed your app, and how they then behaved within the app interface. Note that ID matching does not work in the mobile web. 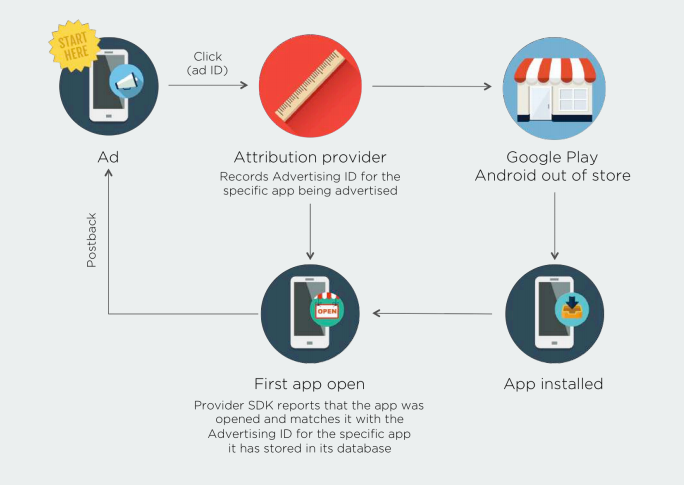 Publishers that configure device ID tracking make it easier for app marketers and attribution providers to track devices from the first ad view or click to the install. While not all publishers enable device ID tracking, or allow marketers to use their platforms for this purpose, device IDs are still one of the clearest and most accurate means of understanding your user as they move from prospect to customer. What kind of privacy can I have with my device ID? While most device users have little desire or need to limit or reset their device IDs, it is still possible to do so on both the Android and iOS operating systems. Reducing, or totally eliminating, the ability of advertisers to track your activity as a user through your device ID is known as limit ad tracking, or LAT. To limit ad tracking on iOS, mobile device users can simply toggle “Limit Ad Tracking” on in privacy settings. Once selected, the iOS will send advertisers a string of zeros instead of the actual device ID, making any identification impossible. To limit ad tracking on Android, users can simply choose to opt out of ad tracking in the Google Ad Settings menu, or reset their device ID completely. While the opt out does not immediately block users from ad tracking, it will signal the attribution provider to stop collecting personal identifiable information (PII) user data from that point forward and thus prevent further use by advertisers. As a note, following the implementation of GDPR regulations in May, regardless of whether or not a user has opted out of ad tracking via their personal operating system, denying consent to device ID tracking via GDPR-compliant notifications will take precedent and either remove past data or stop collection of future data per app for both an IDFA and GAID from an attribution provider’s database, depending on selected user preferences.